Hello everyone! Welcome the very first episode of Reported in the new year. This is a show about discovery, sharing stories on the internet. How is everyone doing, are you struggling to keep up with your new year resolutions? Well if you are, just want to share with you that sometimes. We have to take it easy. Else you will be feeling very miserable and end up affecting your whole year. Maybe if you have given yourself too much goals to achieved try to cut down a bit. Hello everyone! Welcome to episode 3 of Reported. Coming week is going to be short week for everyone, because it is going to be Chinese New Year. So I like to take this opportunity to say GXFC. During this CNY, we will naturally be eating more. Even the MOH, our Ministry of Health have shared on the news that a list of 1000 clinics that will remain open during the Chinese New Year holidays. This is because they are worry that if we eat too much and we rush to the hospital using A&E unnecessarily. Hello everyone! Welcome the very first episode of Reported in the new year. This is a show about discovery, sharing stories on the internet. How is everyone doing, are you struggling to keep up with your new year resolutions? Well if you are, just want to share with you that sometimes. We have to take it easy. Else you will be feeling very miserable and end up affecting your whole year. Maybe if you have given yourself too much goals to achieved try to cut down a bit. Now to the show. Hello 👋 everyone! Welcome of the 50th episode of Nightly, a Nightly podcast about life after work. I have three festive stories to share today. Hello everyone! Welcome to episode 49 of Nightly. My name is Bosslee and I am your host. This is a podcast about life after work. Today was suppose to be my last day at work but it is not. Some situation changed and I have still working for the man. So today I like to shared the story of me changing my mind and the thought process I went through. Hello everyone, Welcome to a Nightly Podcast. A show about life after work. Today we are at episode 48. Never expect to reach here, I think around 20 plus episodes, i want to give up already. Now looking back, it seems that we have just started. Today like to try something like, I like to call it "Ahlee reads the news" inspired by Mr BrownToday we are talking about Socially-conscious enterprise hawker centres. This topic in the news for very long already. So I thought I give my take on it. Now we first need to understand what exactly is the Socially-conscious enterprise hawker centres. 47 ComplaintsHello everyone! Welcome to the 47 episodes of Nightly. My name is Bosslee and I am your host. 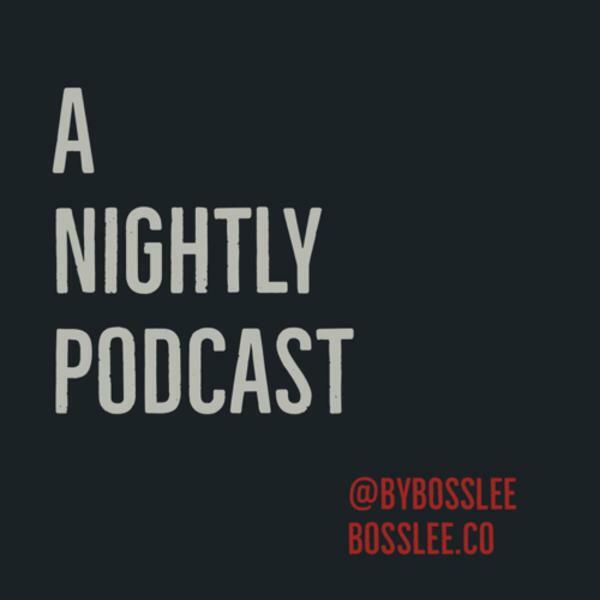 Nightly is a podcast about Life after work and talking about how to get out of the rat race. How is everyone doing today? I am actually recording this on a Saturday Morning. The sun is super bright! Which is great because for the past few days there is heavy rain.Let us jump right in. Today we are talking about customer complaints. If you are a seller be it online or offline, you will for sure encounter a lot of different customers and complaint matters. But do you have to take all the feedback in? For example: recently I met up with a customer. She was complaining about how one area of our service is not flexible and affecting her work. She also kept repeating how another service is super awesome. During the 3 hours conversation, we share with her solutions and workaround but they were rejected as she was expecting our service to work exactly like the others. In short, she was looking for a standardised system so that her employees can have just one workflow as she is selling on many different platforms. She is not wrong, You see the ex-Evernote CEO Phil Libin once said that “Feedback is great for telling you what you did wrong. It's terrible at telling you what you should do next.” So the important thing here is to understand what exactly is the root of the problem. Also sometimes, the customers are very aggressive, so they keep talking and talking giving you no chance to explain. To put that into control, you have to be calm, because we need to understand that they are angry with the matter and not you. We are just a medium. Finally, towards the end. Personally, I deem that 40% of her feedback is very much valuable. The remaining is largely she has no idea of the available functions. So my friends, if you are meeting with a bad experience with a product or service. Please try to control and avoid shouting at the customer service, because we need to also know that they are a medium and not the cause of the problem. Hello everyone! Welcome to the 46th episode of Nightly. My name is bosslee and I am your host. Today, I have two interesting thing to share. One, when you big big boss starts questioning and your boss become a spider, what do you do? Two, have you seen the trending video about a baby bear climb up a mountain to met with its mom. It shows courage and the attitude of it giving up. 46 Can you deep dive? Hello everyone! Welcome to the 45th episode of A Nightly Show. A show about life after work and how to get out of the rat race. So last week, we talk about me leaving a stable job and not having a plan. The goal currently is now is thinking what to do next. Currently, it is something that is to be in the ecommerce space. The next thing I want to share is about a new trending app Tic Tok. Hello everyone! Welcome to the 44th episode of Nightly. My name is bosslee and I’m your host. Nightly talks about Life after work and also ways to get out of the rat race. Today, I like to review about a book titled: Trust me, I’m lying. It’s a very interesting book that talks about the landscape of online media and also how you can try and make your own news go viral. Listen and I love to hear from you. 44 Book Review: Trust Me, I’m lying!! Hello everyone! Have a special announcement to share. Sorry for the wind sound? As I’m a walking as I’m recording this, also if you have any feedback or like to share your thoughts! Please DM me. Thank you! 43 Do you have a plan? Hello everyone! Welcome to the 41 episode of Nightly. In this episode , I shared about an interesting coffee place I found in Nepal; Kar.ma Coffee - where you can pay for any price you deem a for decent long black. Also recently read a book about manipulating media, just nice the we have the incident os S-Hook Lorine goes Viral. One of the chapter closely relates to this. Traveling in Nepal this week for work. Sharing my first time experience in Nepal and some tips for new Travelers. Hello everyone! Welcome to the 39 episode of Nightly. My name is Bossle and I am your host. A Nightly Show is a show about life after work and building a business on the side to get out of the rat race. Today I’m talking about no coffee for 5 days and thoughts about Nas Daily. Hello everyone! Welcome to the 38 episode of Nightly. My name is bosslee and I am your host. Today we talk about Coffee Detox and my passion for voice as a medium. Plus thank you so much for listening. Hello everyone! Welcome to episode 37 of Nightly. My name is Bosslee and I am your host. Maybe this vacation is too long because instead of feeling refresh I am starting to feel lazy. It is like breaking a habit. If you have not taken leave for a long time, this is the exact kind of feeling. You go to work everyday, suddenly you are told to take a rest and you realised you have no idea of what to do. Another thing that I shared in this episode is the unexpected thing that happened. Each time I plan to startup something, I will be thrown a lemon.